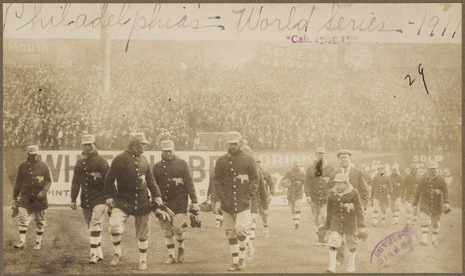 In the 1911 World Series, the Philadelphia Athletics beat the New York Giants four games to two. Philadelphia third baseman Frank "Home Run" Baker earned his nickname during this Series. His home run in Game 2 off Rube Marquard was the margin of victory for the Athletics, and his blast in Game 3 off Christy Mathewson tied that game in the ninth, and the Athletics eventually won in the eleventh. The Giants never recovered. An ironic sidelight was that Mathewson (or his ghostwriter) had criticized Marquard in his newspaper column after Game 2, for giving up the gopher ball, only to fall victim himself the very next day. Baker was swinging a hot bat in general, going 9 for 24 to lead all batters in the Series with a .375 average. The six consecutive days of rain between Games 3 and 4 caused the longest delay between World Series games until the 1989 earthquake-interrupted Series, which incidentally featured the same two franchises, albeit on the west coast. The 1911 Series echoed a classic rematch of the 1905 contest between the New York Giants and the returning Philadelphia Athletics. Pitching was the most noteworthy aspect of the previous Series with five shutouts in five games and the confident Giants were poised for another outstanding performance on the mound. 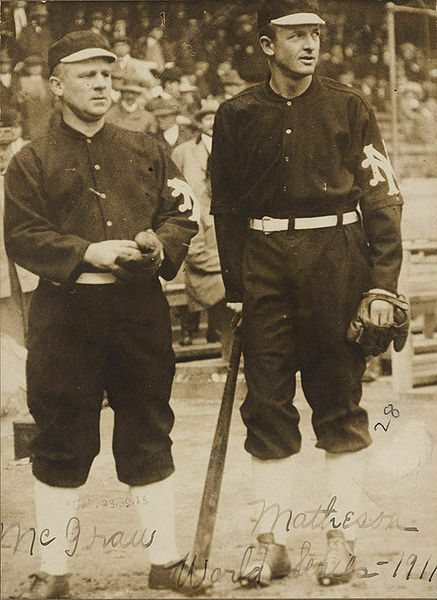 Christy Mathewson, their ace with three shutouts in the 1905 classic, returned to the big show with a 26-13 record and was backed up by a young emerging lefty named Rube Marquard, who had twenty-four wins as well. The A's were also ready as their staff including Jack Coombs, Eddie Plank, Chief Bender and Cy Morgan who had combined for eighty-two victories. Both teams were also dangerous on the other side of the plate. Philadelphia's outfielders Danny Murphy, Bris Lord and Rube Oldring batted a composite .312 and New York had set a long-standing Major League record with 347 stolen bases. The media frenzy surrounding the 1911 Series was unprecedented due to such an even an unpredictable match-up. The A's, were more than ready to defend their championship title and the Giants were ready to repeat history. Some favored Philadelphia as the returning champions, but many felt that New York was a stronger team after overcoming a difficult season in which their ballpark, the Polo Grounds, had burned to the ground. From April to late June, the Giants played at the yard of the American League's new Highlanders (soon to be Yankees) and still managed to win ninety-nine games with no real "home field" advantage. Game 1 opened before a record setting attendance of 38,281 at the newly rebuilt Polo Grounds as once again, Chief Bender and Christy Mathewson went head-to-head in a classic pitcher's duel. After taking the lead in the second when Frank Baker scored on a Harry Davis single, the A's stumbled and lost their advantage after several crucial errors in the fourth. Later in the seventh, New York collected the tie-breaker and 2-1 game winner when Chief Meyers scored on a Josh Devore double. In the end, Mathewson had thrown another six hitter (six was becoming his Series standard) and Bender tossed an impressive five hitter with eleven strikeouts. Game 2 looked very familiar as another stalemate broke out on the mound between New York's Rube Marquard and Philadelphia's Eddie Plank. Neither walked a batter and hits were few and far between. With the score tied at 1-1 in the bottom of the sixth inning, Marquard had retired two in a row, but was starting to show signs of weakening. Frank Baker, the A's clean-up man who was only in his third season, took advantage of the pitcher's fatigue and knocked one straight over the right-field wall. The Athletics held on to win 3-1 and tied the Series at a game a piece. The next day, Baker proved that lightning can strike twice with an encore performance in Game 3. Mathewson had the Giants in the lead 1-0 going into the middle of the ninth when the A's young powerhouse stepped up to the plate and delivered another home run over the right-field wall. The New York pitcher stood in disbelief as he watched a second Giants lead slip away in the final inning. Inspired by Baker's back-to-back performances, the A's also repeated and rallied to a 3-2 triumph in the eleventh inning. Both team's aces had gone the distance with Coombs giving up only three hits and Mathewson surrendering an unimaginable nine. Although the last two games had been close wins, the A's were showing an incredible resolve and started to play like returning World Champions. The Giants on the other hand, were in shock, after giving up two consecutive leads so late in the game, the Series momentum had turned and New York was in trouble. They would have plenty of time to think about it as Game 4 was postponed for an entire week due to rain. When the clouds finally parted, a well-rested Christy Mathewson came back for revenge. This time his long-time advisory, Chief Bender, got the best of him in a 4-2 decision that gave the Athletics a three game lead. Philadelphia came out swinging in Game 5 ready to end it then and there. Coombs had held a 3-0 advantage after six innings and a 3-1 lead going into the ninth. Down, but not out, New York found their own resolve and managed to start a comeback rally while going on to win 4-3 in the tenth. Fred Merkle scored Fred Snodgrass off of Philadelphia reliever, Eddie Plank. The Giants had escaped elimination and forced at least one more outing for the championship title. Unfortunately for Giants fans, the win only prolonged their suffering as New York's luck was about to run out. Philadelphia was disappointed in their failure to shut the door on their opponent in Game 5 and was determined not to fail again. Scoring four runs in the fourth and seven in the seventh, the A's steamrolled the Giants on their way to a 13-2 victory and a second consecutive World Series championship. The Giants had failed miserably at the plate with six starters batting .190 or less and earning only eight runs in six games. One man in particular, clean-up man Red Murray went zero-for-twenty-one. The A's had truly earned their back-to-back title with great tenacity, although most of the credit went to the inspired performance of "Home Run Baker".